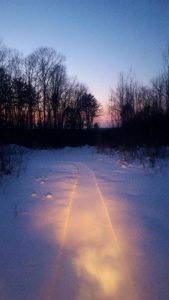 We at Up North Guided Tours help to maintain 3 of the area’s FATbike trails and routes that are open to the general public, all of which are located just South of downtown Cable: Heaven (HVN), Heaven Extended (HVN X), and Tortoise (TRTS). Collectively we refer to the three as the MIGHTY NORTH END. All three are East of HWY 63 and West of Randysek Road. As of February 2019, we altered HVN X and TRTS, and now all 3 are connected! 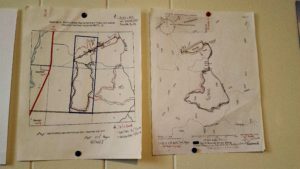 HVN and TRTS are within Bayfield County Forestland with access points off Randysek, and HVN X is on a large tract of private land directly to the West of HVN’s far point. There is next to no signage on these trails and routes, so if you are unfamiliar w/them, if you are open to hiring a guide, and if you have at least a strong set of intermediate off-road bike skills, take our tour, then you’ll know where you are going for your own future self-guided tours. 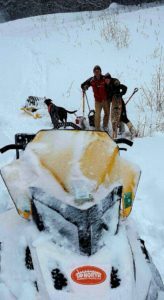 All three, but HVN X in particular, are pretty remote and challenging, so be prepared (parts, tools, hydration, nutrition, some medical gear, extra layers, and communication devices with service) or leave it to us. 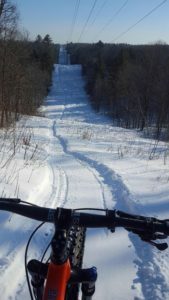 HVN is a route for those with ADVANCED FATbike riding, Snowshoeing, and Nordic Skiing skills as it contains steep pitches, rougher trail, and one enormously steep hill you hike up before riding down! It features both open power lines-style and deep forest primitive 2-track riding, and it contains a few tucked back Snowshoe offshoots. 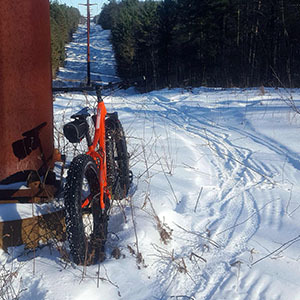 There is no Fatbike and Snowshoe signage on the whole trail, but HVN’s entry is just South of the power lines and about 100+ yards North of the North End Cabin. The signs that WERE at the entry included a Double Black Diamond sign and a Caution Motor/Silent Sports Multi-Use Area sign, so BE CAREFUL/PAY ATTENTION! Be forewarned. HVN’s turnaround point (the far point) is on the power lines, up the enormously steep hill, at the deer stand. With beautiful views in all directions, it’s a great place to catch your breath and gear up for the face-ripping, gravity-based downhill you just climbed! Tip: once you make the initial minute and 15 second climb up Purgatory from Randysek, go right on the 2-track out to the Powerlines, go left at the lines, and follow the Powerlines to the deer stand. Tip 2: once you u-turn at the end of HVN and come down the enormously steep hill from the deer stand and the following hill, look to your right to cut into the wooded 2-track, and follow same down to Purgatory then Randysek . Effectively, HVN is a FATbike/Snowbike barnburner and an incredibly diverse loop that throws a lot of terrain at a rider in a short period of time! 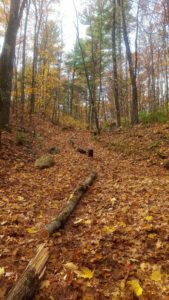 HVN is open so long as Bayfield County Forestry and/or CAMBA have not closed area trails, so it is generally open during Summer, Fall (except during deer season), Winter, and late-Spring seasons. We groom HVN in the Winter for snow biking as much as we can, typically Thursday nights. Grooming HVN can be Tricky. Thanks to River’s Eatery for Bailing Us Out during the Winter of ’18/’19! HVN X Highpoint. Snowbike Gravity, Enduro, and Pump-Track all in 1. Standing on the Verge of Getting It On! HVN X, like HVN, is for those with ADVANCED skills due to several enormous steeps, a natural gravity and pump track section, and prolonged climbs. 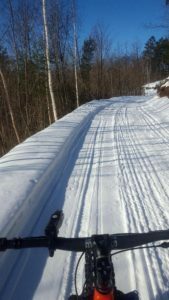 It blends open Powerlines-style riding with 2-track riding; but unlike HVN, HVN X is only open for Snowbiking, Snowshoeing, and Nordic skiing from mid-December thru mid-March. Yes, that is right, HVN X is a WINTER ONLY Fatbike Trail. Please note that: HVN X is the most remote trail we help to maintain, as it starts and ends at HVN’s far point, the deer stand; like HVN, it contains some the most challenging terrain in the entire area; and HVN X’s challenges reward you with some of the very best backwoods views. Follow our 33” groomed lane around HVN X, you will not be disappointed! It is the real deal as it incorporates Flow, Gravity, Pump-Track and Enduro forms of off-road winter riding. Tip: for 2019, instead of turning left after the Powerlines Pump-Track section that takes you over to the rectangle, go right and check it out! We groom when we can, typically Thursday nights. One of many great HVN X vantage points! This pic was from our Winter of ’17/’18 Grooming Route. 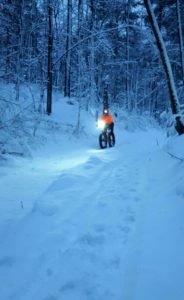 TRTS WAS an INTERMEDIATE Snowbike route that was best categorized as cross country riding. For the Winter of ’18/’19, TRTS starts out as a XC route, but it now takes you to the HVN X rectangle, and the only way out, less using TRTS as an out-and-back, is via HVN X and HVNs’ steeps! For the Winter of ’18/’19 TRTSs’ only entry is to the North by the deer ex-closure. No bicycles are allowed on TRTS any time of year, except Winter. TRTS is also a SNOWMOBILE route, so exercise extreme CAUTION/play defense. Accordingly, please do not wear ear buds, keep all your senses alert, and remember that “sharing (trail) is caring.” That is one example of Up North Guided’s trail (sharing) advocacy work. TRTS is important in that it is the first corridor where Snowbike and Snowmobile share use in all of Bayfield County! Tip 1: pull off to the side when you hear snowmobiles and figure they are not looking for you. Snow drifting does happen on this trail, so Tip 2: we groom on the Western side of the trail. Remember, TRTS has no Snowbike signage, so the Northern Entry of TRTS is off Randysek at the Southeastern corner of the Deer Ex-Closure fence. Tip 3: at the TRTS entry follow the fenced Deer Ex-Closure for about 200 yards, then go left at the split so you are heading away from the Ex-Closure in a perpendicular fashion. We groom when we can, typically Thursday nights. If you are looking for a self-guided tour, come to our shop in downtown Cable during Summer and Winter months to rent our higher-end Borealis Flume Fat Tire Bikes and Tubbs Wilderness 30 Snowshoes, or give us a call about our Chicago Area equipment rentals during Spring and Fall. We will custom fit you to our equipment, and we will provide you with riding directions and area tips. And of course, if you forgot apparel at home or are looking for new items, we have a solid selection for you to choose from. Have a ton of safe fun!! !